The ideal travel companion, full of insider advice on what to see and do, plus detailed itineraries and comprehensive maps for exploring this picturesque and unique country. Marvel at the iconic Matterhorn, explore the fascinating art galleries and museums of Basel, or stroll around the historic town of Lausanne on Lake Geneva: everything you need to know is clearly laid out within colour-coded chapters. 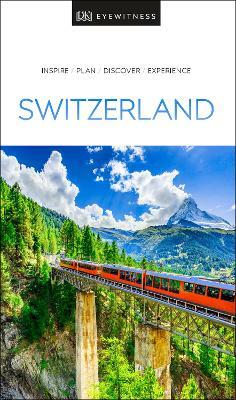 Discover the best of Switzerland with this indispensable travel guide. Inside DK Eyewitness Travel Guide Switzerland: - Over 35 colour maps help you navigate with ease - Simple layout makes it easy to find the information you need - Comprehensive tours and itineraries of Switzerland, designed for every interest and budget - Illustrations and floorplans show the inside of icons such as Geneva's impressive Cathedrale Saint-Pierre, Bern's masterpiece-filled Kunstmuseum, the enchanting Chateau de Chillon and more - Colour photographs of Switzerland's historic cities, picturesque towns, impressive architecture, beautiful scenery and more - Historical and cultural context gives you a richer travel experience: learn about the country's varied languages, alpine environment, unique architecture, tunnels and railways, traditional festivals, as well as outdoor activities including skiing and hiking - Detailed chapters, with area maps, cover Bern; Mittelland, Bernese Oberland and Valais; Geneva; Western Switzerland; Northern Switzerland; Zurich; Eastern Switzerland and Graubunden; and Central Switzerland and Ticino - Essential travel tips including our expert choices of where to stay, eat, shop and sightsee, plus visa and health information DK Eyewitness Travel Guide Switzerland is a detailed, easy-to-use guide designed to help you get the most from your visit to Switzerland. DK Eyewitness: Silver award-winner in the Wanderlust Reader Travel Awards for Guidebook Series 2018. No other guide whets your appetite quite like this one - The Independent On a tour of Europe? Try our DK Eyewitness Travel Guide Europe. About DK Eyewitness Travel: DK's highly visual Eyewitness guides show you what others only tell you, with easy-to-read maps, tips and tours to inform and enrich your holiday. DK is the world's leading illustrated reference publisher, producing beautifully designed books for adults.